Corona, CA – California West Investments LLC, has officially launched a Kickstarter campaign for garnering widespread support and financial backing for Toss-It!, an innovative solution to getting rid of unwanted cooking grease. Toss-It! Is a patent pending zipper sealable kitchen container/bag that serves as a disposal unit for unwanted kitchen grease? Manufactured to lay flat before use, each ready-to-use Toss-It Bags expands to hold and dispose of 14ozs of cooking or kitchen grease when full. According to information provided by the Company, the U.S. Environmental Protection Agency (EPA) has studied the effects of FOG (Fats, Oils and Grease) and its relationship with drainage backups at waste water reclamation and sewer plants and has discovered in the U.S., approximately 48% are due to line blockages, of which 47% are related to FOG deposits that constrict the access of pipe. Toss-It! aims to tackle this problem by proving consumers with a cost effective product that is also environment friendly. Each package of Toss-It! comes with 6 individual bags. Depending on how active a user’s kitchen is, the Company estimates that 6 bags may last an entire year. Users may continue to use a Toss-It bag until it is completely full before placing it in the garbage. With the heavy duty zipper, odors and leaking is not an issue, according to a company spokespersons. Kickstarter is a funding platform for creative projects. Everything from films, games, and music to art, design, and technology. ‘Backers’ who support Toss-It! on Kickstarter get an inside look at the development process and will help that project come to life. 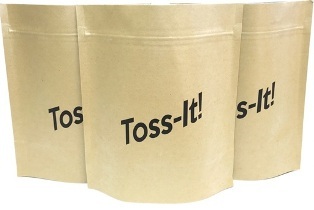 All Backers of the campaign will receive ‘Rewards’ ranging from a package of 6 Toss-It! bags for a pledge $6 or more, to receiving 4 Packages of Toss-It! Bags (24 pcs total) for a pledge of $20 or more. The Kickstarter campaign is officially open until August 22, 2016.